Today, most endeavours require teamwork by people with diverse skills and characteristics. In managing teamwork, decisions are often made under uncertainty and resource constraints. The strategies and the effectiveness of the strategies different people adopt to manage teamwork under different situations have not yet been fully explored, partially due to a lack of detailed large-scale data. In this paper, we describe a multi-faceted large-scale dataset to bridge this gap. It is derived from a game simulating complex project management processes. It presents the participants with different conditions in terms of team members’ capabilities and task characteristics for them to exhibit their decision-making strategies. The dataset contains detailed data reflecting the decision situations, decision strategies, decision outcomes, and the emotional responses of 1,144 participants from diverse backgrounds. To our knowledge, this is the first dataset simultaneously covering these four facets of decision-making. 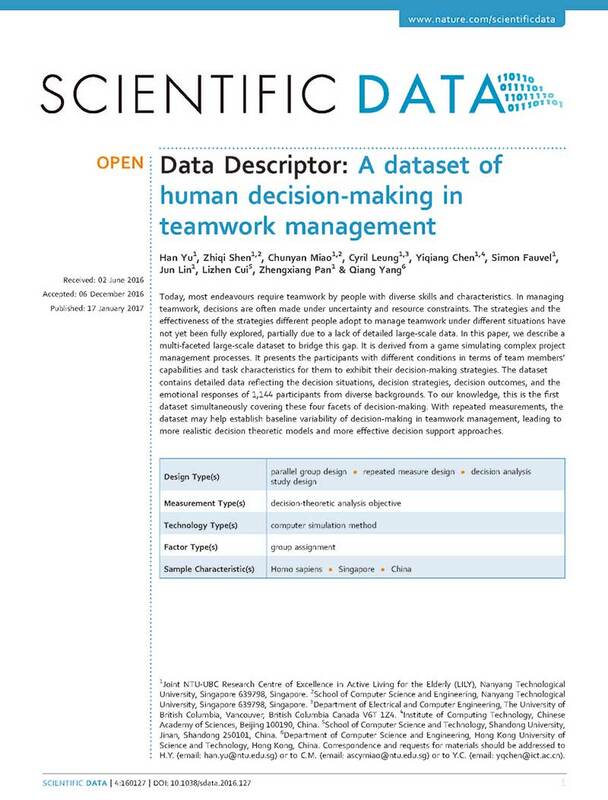 With repeated measurements, the dataset may help establish baseline variability of decision-making in teamwork management, leading to more realistic decision theoretic models and more effective decision support approaches.